Those of you eager to start gaming on Steam right after you’ve installed 3rd party non-free GPU drivers are likely to come up against an error regarding direct GLX rendering not being available to Steam. This issue occurs because currently Steam is only available as a 32-bit binary and and you may only have the native 64-bit graphics driver libraries installed. This issue regularly occurs on 64-bit Linux distributions when running 32-bit software that requires GLX rendering without having 32-bit GLX libraries installed. 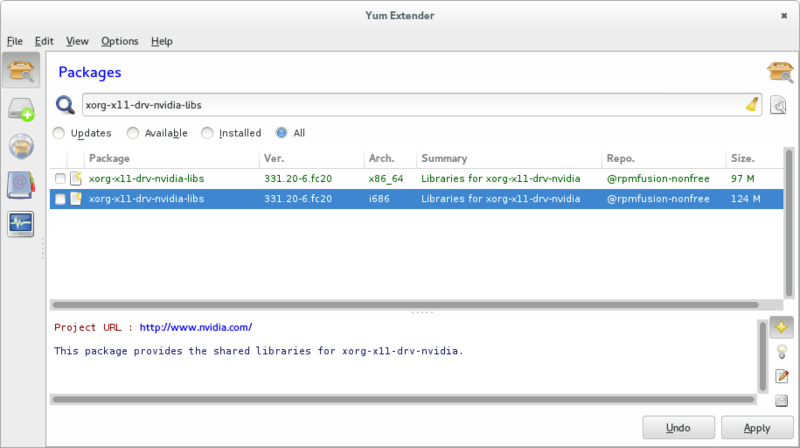 If you prefer to use a GUI open Yumex, search for xorg-x11-drv-nvidia-libs and you will be able to see both the x86_64 & i686 packages. Tick the i686 package and select the Apply button to install it. Currently as from the release of Fedora 20 the AMD Catalyst drivers are no longer available from the RPMFusion repositories as the Catalyst package has been orphaned by the maintainer, therefore it is not currently possible to install AMD Radeon drivers easily with Pharlap, the Driver Helper tool included with Chapeau or by installing the RPMFusion packages with Yum. There are currently no firm details on when these packages will return to RPMFusion. If you have downloaded and manually installed the Linux driver supplied by AMD and ended up here due to lack of 32-bit support it is recommended that you seek assistance on the the AMD Forums or the Fedora Forums. If you can’t get these drivers going uninstall the AMD driver and continue to use the default Mesa driver which apparently is in better shape than Nvidia’s open driver, Nouveau and is due to get noticeably better in kernel 3.13.